Our mission is to leverage the recycling of unwanted electronics for environmental protection (keeping eWaste out of landfills)and charitable works. Like all other electronic recyclers we offer disposal services for computers and other electronics (eWaste). 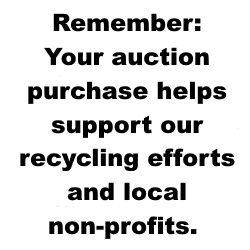 Unlike most other recyclers, we are a non-profit organization. We accomplish the charitable works part of our mission by donating re-usable electronics to other non-profit organizations. What we don’t donate, we sell to fund ourselves and other charitable organizations. Material that is not re-usable (too old, broken, etc) is sorted by type and passed along to certified recyclers for material recovery. This allows us to fulfill the environmental protection part of our mission by making sure the material is recycled and diverted from a landfill. Give us a call, we want to help! * as a 501C3 Organization, donated material may be tax deductible. Please consult your tax adviser for more information.